You must be a member of the Munich Jazz, Pop and World Music Group to attend this activity. Would you like to join this group? Dear Jazz Lovers, it is time of the famous Jam Session at the Jazzclub Unterfahrt! 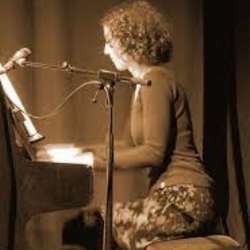 As a third of the "Drei Damen", a member of the band Etna or most recently in a joint quartet with the saxophonist Carolyn Breuer, the Munich pianist and singer Andrea Hermenau has achieved much attention. She concentrates on the essentials in her playing, does not waste any notes and relies on the beauty that can be created by means of sensitive harmonies and crystal clear melodies. A composition studies with Thomas Zoller in Dresden has promoted her talents as a composer - from which one can convince herself of Andrea Hermenaus on the Swiss label Unit Records released album "Die Nachtpracht". Today she leads the jam session and is looking forward to newcomers. Everyone buys/reserve the ticket for her/himself. The reservation is valid until 20.30 of the event day, then you loose the right of your place. If you are coming, it is advised to reserve the ticket in advance (until the 18 o clock of the event ) Sunday evening , below you find the link, you can write in the reservation Wünsche "Bitte am Tisch mit Salvatore Asciore", so they know that we are all together. By completing the form you arrange a binding ticket reservation. The tickets will be deposited at the box office. Please come on the day of the event no later than 30 minutes before the concert begins. You can buy the entrance also at the evening of the jamsession, if they are still available, but of course then you will get a remaining place and a random table. Please do not be later than 20.30.